2017 g model line of Midea equipment, namely the split-system series Blanc, Mission, Ultimate Comfort, Oasis Plus have successfully passed the test for compliance with a number of technical parameters, according to Eurovent standards. This fact confirms the high quality of the products and full compliance with the expectations of customers all over the world, as the company produces air conditioners for all major world markets, offers sales and service support through its distribution network on all continents. Only the most famous and popular world manufacturers of air conditioners provided their products for certification in the laboratory Eurovent, which carefully analyze a range of characteristics and conduct critical test kits for compliance with the declared factory parameters of devices. Using the "Gear Control" function, you can adjust the electricity consumption of the air conditioner by forcing the value in 50%, 75% or 100% of the power. Limiting the capacity of the system will save energy and "fit" into the limit of power consumption, if necessary. 2. GA Stepless Comfort Technology. Smart sensor technology determines not only the temperature, but also the humidity in the room, you can also choose the mode of dehumidification Power / Normal, or set a comfortable level of humidity in the range of 30-90%. The configuration is carried out using the application Midea-Air App, through a home network Wi-Fi. Technology 180° -gradusnogo wave inverter conversion - control voltage without the "pulse" effects (jagged sinusoid). Ability to work with a wider range of supply voltage and frequency. Most of the energy efficiency and energy conservation. More soft start, lower noise and vibration. Increased heat. This unit uses the heat exchangers with tubes of a special design, the inner surface of which has trapezoidal notches "Innergrove cooper", which provides maximum heat transfer surface area increased. Due to this heat increases by 28%, reduced power consumption, and hence increases the efficiency of the system. The Sensor "INTELLECTUAL EYE", "sees" the presence of people in the room, which allows you to effectively direct the air flow either to the area of people's location or away from people on the basis of a wish (installed on the remote control). The infrared sensor will determine your location. In addition, if you are away for a long time - then the air conditioner turns off, and when you come back - it will turn on again. Read more about Sensor "INTELLECTUAL EYE"
Self-cleaning. When you turn off the air conditioner, the indoor unit shutters are closed, but the fan continues to operate for another 10 minutes. ventilating and drying out the heat exchanger. Economy mode (Eco-mode). Conditioning supports indoor air temperature + 24 ° C with minimum noise and power consumption. Protection against freezing of the room, maintaining the temperature of +8°C. The control system of air conditioners can keep the room air temperature +8°C, so as not to cool the walls and freeze the water pipe. It is actual to use for summer residences, garages or if you leave on leave in the winter, and the constant warming up of a premise to a comfortable temperature is not required. At the same time, the air conditioner consumes less electricity, because the temperature difference between the street / room is also reduced. The technology "Inverter Quattro", refrigerant R32, as well as the heater of the crankcase of the compressor and pallet of the outdoor unit allow us to confidently use the air conditioners of some series for heating at -30°C, and in the cooling mode up to + 50°C. Optimum operation algorithms allow smooth switching of the compressor power and speed of the fans of the indoor and outdoor fans, creating comfortable conditions for the user. 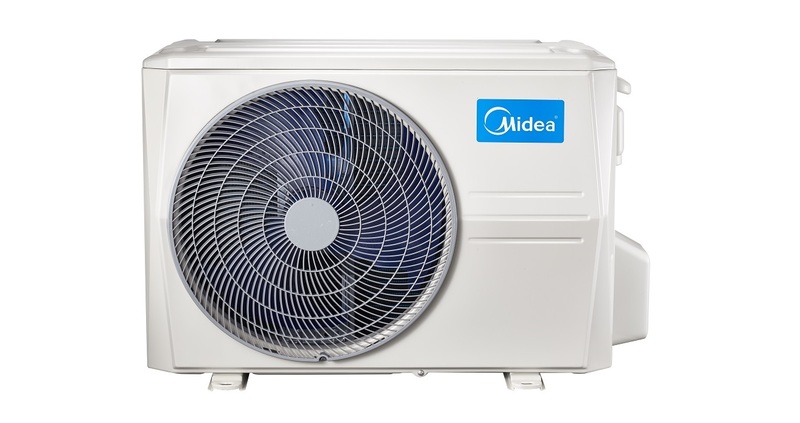 Designers Midea did not forget about the exterior of the exterior unit of the air conditioner, which in itself is a rarity for climate technology. The outdoor unit is much more elegant than its counterparts, it has facets like a diamond, and attention to detail speaks of a high level of production and a carefully thought-out design concept. Read more about Outdoor unit design "Brilliant"
In outdoor units, a DC motor is used to rotate the fan. This allows you to significantly reduce noise and power consumption. And also get several positions of the fan speed, depending on the needs of the system. The indoor unit is used to rotate the impeller DC - motor. This can significantly reduce noise and power consumption. And also get 12 positions change the speed of the impeller. The light sensor located under the front panel allows you to control the level of light in the room. If the illumination begins to decrease, then the brightness of the display on the indoor unit will also start decreasing stepwise, and disappear completely in 5-7 seconds after the light disappears. When the light is on, the glow of the indicators will resume. BuilT-in infrared Sensor - a human presence sensor. It detects the presence of a person in the room, and if the people in the room long absence, the air conditioner automatically switches to "Waiting". The unit has a built EXV - Electronic expansion valve. The vertical louvers of Midea air conditioners swing at an angle of 110° (ordinary air conditioners only swing at 80°), while the horizontal louvers swing at 120° (ordinary air conditioners only swing at 90°). These more flexible louvers provide cooling which is wider and more even. Mission's Wi-Fi and Smart Kits* are designed for even more comfortable and easy operation. Customers can download absolutely free app for your smartphone with the QR-code located in the user's manual. function «Turbo» - when you turn on this mode, air conditioning provides the most rapid cooling or heating, to create comfortable conditions in the shortest possible time. The remote control RG70 on the Midea Blanc air conditioner has a unique Super button. With only a single click of this button, the fan inside the air conditioner will run at a high speed to deliver a super powerful air flow, quickly lowering the room temperature to 17°C. The "Silence" - air conditioning reduces the fan speed of the indoor unit to a minimum, with the noise of the air conditioner as well reduced. Its a electronical function of Main PCB and self-diagnostic system into AC. When pipe-temperature sensor at inlet line of evaporator will indicate highest temperature, system will indicate "Ec" code in a display of indoor units, its mean "ask for service centre for visit maintance team with leakage detectors and tools"
The new refrigerant R32 (difluoromethane) has significant advantages. First of all, it concerns the potential of global warming (GWP). If we compare the highly popular R410A refrigerant with R32, the latter differs by more than 65% of the GWP reduced. It follows that the environment is less affected by the new refrigerant. Also, R32 is characterized by reduced viscosity and density. Due to the lower density, the freon consumption is reduced, taking into account the same power figures. The density of difluoromethane is almost 30% less than that of R410A. Mode is activated with the remote control and provides a comfortable environment for a peaceful and deep sleep during the 7-hour cycle with a temperature change of reference values​​, as well as setting the minimum noise level and economical energy consumption. After that, the temperature returns to the originally specified value. Low-temperature (season) set - used for the operation of the air conditioner in cooling mode at low ambient temperatures (usually provided in the air conditioner as an optional feature). The kit includes: the controller of the outdoor unit fan motor, compressor crankcase heater and heater drain line. In some series of inverter split systems this option is implemented in hardware and software, thus if there is a need to use the air conditioner in the winter for cooling, you must install only drain the heater. Funktsiya "Stezh za mnoyu (Follow Me)"
Pry vklyuchenni tsiyeyi funktsiyi na PDK, protsesor keruvannya vnutrishnʹoho bloku bude otrymuvaty dani pro temperaturu v kimnati z temperaturnoho datchyka, vstanovlenoho v pulʹti dystantsiynoho keruvannya, shcho dozvolyaye bilʹsh tochno rehulyuvaty robotu kondytsionera, dosyahayuchy zadanoho rezhymu v zoni znakhodzhennya PDK v kimnati. Zona diyi syhnalu vid pulʹta ne perevyshchuye 8 m.p. po pryamiy liniyi "pulʹt - vnutrishniy blok". Dry mode automatically selects cooling, based on the difference between fixed and temparaturoy actual room temperature. The temperature is regulated while reducing humidity repeated switching on and off of the cooling and ventilation only. when the dry mode on the remote control shows "Drop"
Compressor with inverter DC can increase the efficiency of the air conditioner, thus reducing power consumption saves your costs. This system is much more economical and safer than air conditioners with a constant output of the compressor. Blue fin heat exchanger cover - Protection against corrosion. Special anti-corrosion coating of the heat exchanger, protection from atmospheric phenomena and effects of aggressive environment. The unit has auto horizontal swing and auto vertical swing function, which supplies more even and comfortable air flow.